ExpressVPN is a high-profile market-leading VPN provider. In the past, I have had a couple of reservations about minor technical aspects of ExpressVPN’s service. But in this new ExpressVPN review, I find myself very impressed. ExpressVPN is a very professional service that is dedicated to ensuring customer satisfaction. 24/7 customer support, a 30-day money guarantee, and software that has been designed to be as easy to use as possible amply demonstrate its customer-facing philosophy. Recent improvements have made what was already a very good (and popular) service even better. The encryption is now among the best I have encountered in the industry. And although a few minimal logs are kept, these are very minimal. ExpressVPN now provides an excellent service. ExpressVPN offers a simple one-size-fits-all plan. Prices start at a slightly steep $12.95 per month, but quickly drop for longer-term purchases. If you pay annually, the price drops to a much more reasonable $8.32 per month. Although no free trial* is offered per se., ExpressVPN does offer a very generous 30-day money back guarantee. In this regard, in fact, ExpressVPN is an industry leader. Many other providers place hidden restrictions on such offers, or simply refuse to honor them. Not so ExpressVPN, which means it when it describes its 30-day money back guarantee as “no-quibble”. After moderating the comments we receive at BestVPNReviewz.com for around four years now, I have not received a single complaint about ExpressVPN regarding this offer. * A seven-day free trial of the iOS app is available, as is a one-day free trial of the Android app. Apparently, this disparity is due to the trial periods being set by the Play Store and Apple Store policies, rather than by ExpressVPN. In addition to this, ExpressVPN runs a very generous referral program – for each friend you refer, you both get 30 days free! I will discuss features below, but will just note here that ExpressVPN throws in a free Smart DNS service for all customers. This greatly enhances the value of its package. ExpressVPN operates servers out of 136 cities in 87 countries. This includes places such as Australia, New Zealand, the Middle East, and Africa, which often get little in the way of love from VPN companies. You can connect up to three devices to the service at once. Most major VPN protocols are supported, although I recommend using OpenVPN where possible (and avoiding PPTP like the plague!). Available protocols include PPTP, L2TP/IPSec, SSTP, and OpenVPN (TCP and UDP). Smart DNS enables geospoofing by resolving your DNS requests at a specified location. No encryption/decryption is involved, and the DNS translation is pretty much instantaneous. This means that Smart DNS services suffer fewer buffering issues than when using VPN for streaming (although distance can still cause problems). Another advantage of Smart DNS is that can be configured on any internet-capable device. Not just ones that can run VPN software. This means that you can use Smart DNS on your smart TV, games console, and Roku (among others). ExpressVPN operates “stealth” servers located in Hong Kong. Although designed specifically to allow users in mainland China to bypass the Great Firewall, these should be helpful for bypassing VPN blocks elsewhere. As I am based in the UK I cannot test the effectiveness of these servers myself. But according to reports, they generally work well (remembering that nothing can be guaranteed when it comes to China). Interestingly, ExpressVPN now runs a .onion website. This is a mirror of its open-web website, but is a Tor Hidden Services site. This means that it can only be accessed via the Tor Browser, and that it is almost impossible to censor. This is great news for people in places such as China, who might otherwise have trouble accessing the ExpressVPN website in order to sign up for the service and download its software. ExpressVPN is based in the British Virgin Islands (BVI). As a British overseas territory, its exact relationship to the UK government with regards to GCHQ spying is unclear. But for most purposes being based in the BVI should make ExpressVPN highly resistant to most forms of pressure (including over copyright issues). This is not a huge amount of information. But it could, in theory, be enough for a determined adversary to perform a successful end-to-end timing attack. AES-256 cipher with RSA-4096 handshake and SHA-512 HMAC hash authentication. A new development I noted in this ExpressVPN review is that the provider now uses Elliptic Curve Diffie–Hellman (ECDH) key exchanges for data channel encryption. This means that ExpressVPN’s OpenVPN connections now use Perfect Forward Secrecy, which is great. The ExpressVPN looks smart. It is also packed with information, although not all of it is as easy to find as I would like. I would have no idea, for example, on how to find the excellent page detailing the encryption ExpressVPN uses if the Live Support staff had not provided a link to it. This, however, is a very minor quibble. Readers of this ExpressVPN review may also enjoy the provider’s rather good and regularly updated blog. ExpressVPN is famous for its 24/7/365 days a year support. I had no trouble connecting instantly to a staff member via Live Chat. I have in the past received a few comments from readers dissatisfied at the technical competence of ExpressVPN’s support staff. But the members I talked to were either able to answer my questions directly, or direct me to resources that answered my questions. Everyone’s experiences of these things differs, but I was perfectly happy with the support I received while conducting this ExpressVPN review. Signing up is a straightforward process. The only personal information requested (other than payment details) is a valid email address. This is necessary in order to send you subscription confirmation and download links for the software. But there is nothing preventing you from using a disposable email address. In addition to credit card, PayPal, and a few more obscure options, you can pay using Bitcoins. If purchased anonymously and/or properly mixed, this can provide a high level of privacy when buying a subscription. Once you have signed up, you will be sent a confirmation email containing various links you might need. ExpressVPN specializes in making its service easy-to-use and as layman-friendly as possible. This philosophy is exemplified by its desktop client – simply select a location, and hit “Connect”. It really couldn’t be easier! In addition to an almost full suite of VPN protocol options, Network Lock is a firewall which prevents DNS leaks and acts as a kill switch (by preventing all internet traffic entering or leaving your PC except through the VPN). 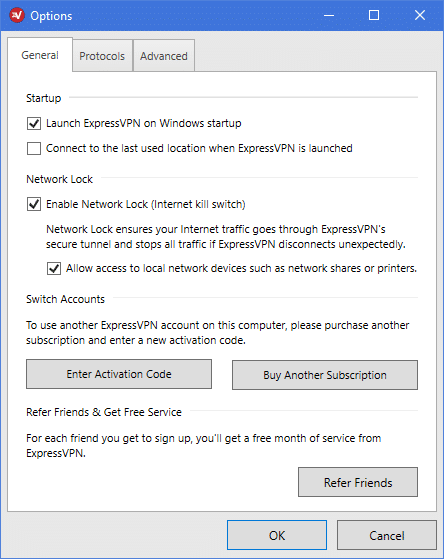 So overall, the ExpressVPN Windows client is great! It did, however, fail to disconnect properly on a couple of occasions, and needed to be shut down in Task Manager -> Services. This was even after quitting the app in order to fully disconnect from the VPN. I am confident that is a fairly minor bug will be ironed out in future updates. 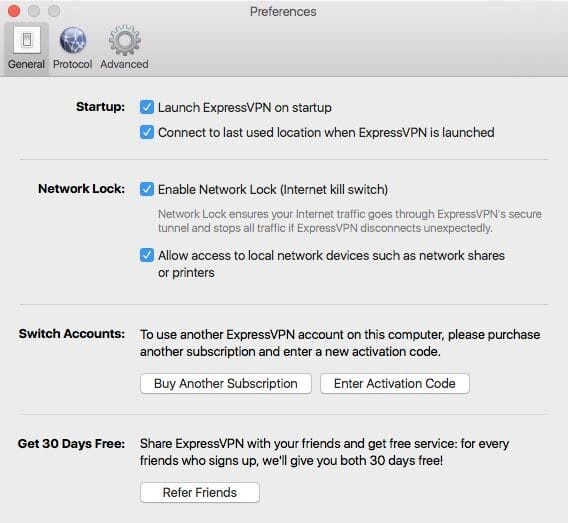 The ExpressVPN OS X/Mac OS app looks identical to the Windows client, except for Mac-related cosmetic details. Tests were performed using a UK 50 Mbps / 3 Mbps fiber connection. The relatively modest UK control test speeds (no VPN) may be down to the powerline adaptor I use. It is also worth noting that UK and US tests were performed on separate days. All tests for this ExpressVPN review were performed using the OpenVPN (UDP) protocol. As you can see, these are generally excellent results. Download speed loss due to being connected to a nearby VPN server was less than 10 percent. Using ExpressVPN I was able to stream content from both US Netflix and BBC iPlayer. So top marks in this regard. ExpressVPN offers full GUI apps for Windows, Mac OS / O SX, Android and iOS. As discussed in more detail in 5 Best Linux VPN Services, ExpressVPN also offers a basic custom Linux VPN client. It is Terminal command-line only, but works well and is simple enough to use. It even includes DNS leak protection. Detailed manual VPN and Smart DNS setup guides are also provided for a wide range of devices. I have been provided with a Linksys WRT 1200 AC router pre-configured to run ExpressVPN, so look out for a review of that soon. The Android app is compatible with Android 4.2+. It can be installed from the Google Play store or downloaded as a .apk file. ExpressVPN has always run a very tight ship when it comes to customer service. Its apps are easy to use, I found the 24/7 instant Live Chat support to be excellent, and the 30-day money-back guarantee is surefire. The referral program is also very generous. Since I last wrote an ExpressVPN review, it has really beefed up various aspects of its service that I was less happy with. The encryption it uses is now among the best in the business. And the number of logs it keeps has been stripped right back (although some still exist). As is, there really is very little to complain about. ExpressVPN offers what is very arguably the most polished and professional all-round service in the business. I’m impressed.